Vegetarian food blog featuring delicious and nutritious home cooked recipes, creative baking and luscious chocolate. Kefir has been such an integral part of our lives for so many years now, that I’m always a little taken aback when people either don’t know what it is or have never tried it. 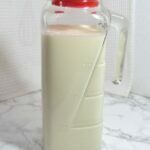 So I thought I’d knock up a post for the benefit of those not in the know about kefir and tell you what it is, how to make it and what to do with it. Kefir is a cultured milk drink originating in the Caucasus and dates back to at least 1000 AD. The name is derived from the Turkish word for “feeling good” keyif. It’s a symbiotic mix of a whole host of micro organisms, including bacteria and yeasts, which ferment the sugars in the milk. It’s an excellent probiotic and is thus good for general digestion and gut health. It also contains healthy amounts of protein, calcium, phosphorous, vitamin B12, riboflavin, magnesium and vitamin D. There are two types of kefir, milk kefir and water kefir, otherwise known as tibi. When made correctly, tibi can be delicious and when flavoured with lemon, ginger or both it makes for a refreshing and fizzy thirst quencher. Although very similar, there are slight differences. Here I am writing about traditional milk kefir made with cow, sheep or goat milk. What Does Kefir Taste Like? I drank my first glass of kefir as a teenager on a school trip to Moscow. I really liked it then and I really like it now. When it’s at its best, it tastes slightly sour, a bit like mild creamy yoghurt, but with a bit of a fizz to it. It’s runnier than yoghurt and is best sipped from a glass rather than eaten with a spoon. The flavour will vary depending on whether cow’s, goat’s or sheep milk is used. We always use organic milk, sometimes cow and sometimes goat. When we had a ready supply of raw milk, we used that. Not only did the raw milk increase its beneficial properties, but it tasted better too. Sadly, we lost our supply so we make do with pasteurised now. We like to use whole milk, but you can use skimmed or semi skimmed if you really want to. CT is the kefir king in our household. He was making it before ever I met him, well over twenty years ago now – eek, how time flies. The culture (or grains as they are termed) are gelatinous in texture and look a bit like cauliflower florets – and they grow. CT has kept our current grains for about eighteen years. From time to time they’ve become a little neglected and at one point they were rejuvenated by adding some kefir grains that had been grown by Carl Legge. Turns out Carl’s grains came from CT back along, so the grains were happily reunited. Looked after correctly, they should go on forever. 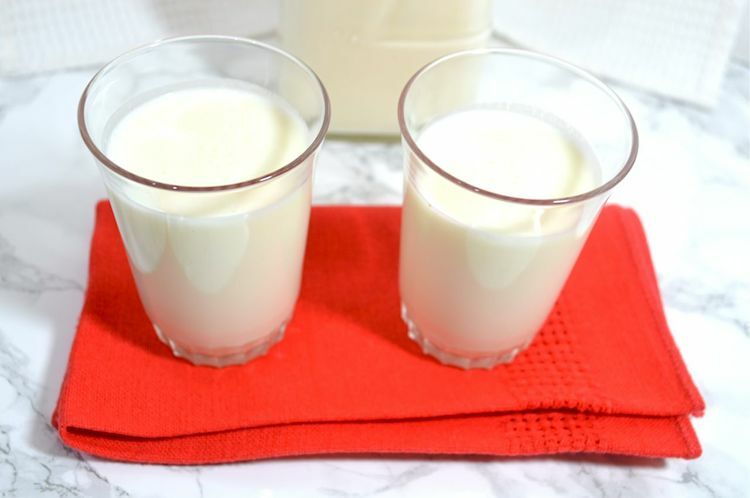 Kefir is actually very simple to make. The trick is to keep making it regularly. The more you make it, the better it will become. All you need to do is add some kefir grains to milk and leave for 24 hours, giving it an occasional stir. When it’s thickened, strain it through a sieve and it’s ready to drink. The grains are then set to make another batch. The recipe given further down makes enough for 8 x 125ml glasses, or 4 x 250 ml glasses or if you’re really hungry 2 x 500ml glasses. As a health supplement, a small glass a day is fine. Kefir is a living culture and needs regular feeding and attention. It will ferment in cooler temperatures, but will take longer to thicken. It’s important that you use a glass jar, a plastic sieve and wooden utensils not metal as this is detrimental to the culturing process. If you’re vegan, you can use non dairy milk, but coconut milk is said to be the one that works best. You’ll need to refresh it occasionally with dairy to reinvigorate the grains. Kefir will keep in the fridge for 3-5 days. It may get fizzy. Lucky you. This is desirable. Over time the grains will increase in size and number. The surplus will need to be removed – share with your friends. Kefir grains can be stored in the fridge for several months. Place into a screw top glass jar and cover with milk. If reviving from dormancy, it will probably take longer to ferment and you may need to make one or two batches to restore quality. CT used to make up a batch once a week and we’d have a small glass before breakfast most days. It keeps perfectly well in the fridge and just gets slightly fizzier and slightly more nutritious. These days I’m really into smoothies and when we have them, they constitute our breakfast, so we have our kefir in larger quantities than we used to. I add all sorts to our smoothies: mango and carrot, various greens, beetroot, berries, baobab, turmeric, cacao, the list goes on. I also use it a lot in baking; where you might use buttermilk, I use kefir. It reacts with any raising agents and helps to make bakes rise. It also adds slight sour notes, which I find particulary welcome in sweet bakes. Plus it has such good health benefits, why wouldn’t you use it? It makes fantastic pancakes, scones and soda bread, sometimes I add it to yeasted bread too. It also works well in cakes as you can see from the triple chocolate cake I made recently. We also make a simple cream cheese from our kefir. We strain it through a fine muslin cloth and leave it for 12 to 24 hours depending on the temperature and time of year. It’s nice just as it is, but won’t keep very long without a little salt being added. You can see some of the plain cheese I made in this plum and rose cheesecake bake. For the more adventurous among you, this fabulous fermented drink can also be used to make a hard cheese. CT reported favourably on the sample he tried at Carl’s last year. A tasty fermented yoghurt type drink that is both nutritious and easy to make. It makes fabulous smoothies and can be used in place of buttermilk for all sorts of recipes. Pour in the milk and stir. Leave at room temperature, stirring occasionally for 24 to 48 hours or until the milk thickens. Strain through a plastic sieve into a suitable glass or ceramic container and use in any way you like. Return the grains to a clean jar and start the process again. Under most circumstances washing the grains is not recommended. This makes enough for 8 x 125ml glasses, or 4 x 250 ml glasses or if you're really hungry 2 x 500ml glasses. It's important that you use a glass jar, a plastic sieve and wooden utensils not metal as this is detrimental to the culturing process. Over time the grains will increase in size and number. The surplus will need to be removed - share with your friends. If reviving from dormancy, it may take longer to ferment and you may need to make one or two batches to restore quality. For more information, you can do no better than head to Dom’s Kefir Insite. He knows pretty much everything there is to know about kefir. And if you like the idea of whizzing up a kefir smoothie, have a look at the Froothie range of high speed power blenders. I absolutely love my Optimum Vac2 Vacuum Blender, which has the added bonus of retaining more of the ingredients’ vital nutrients by removing excess oxygen before blending. Take a look at my Vac2 Review if you’d like to know more. If you have a go at making homemade kefir, I’d love to hear how you get on. 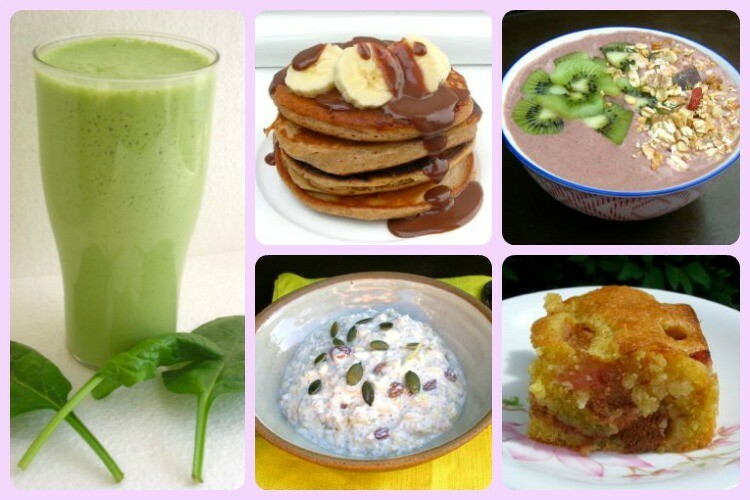 For more nutritious and delicious recipes, follow me on Twitter, Facebook, Instagram or Pinterest. How to Make Kefir & What To Do With It. PIN IT. This post contains affiliate links to Froothie Optimum products. Buying through a link will not cost you any more, but I will get a small commission. Thanks to my readers for supporting the brands and organisations that help to keep Tin and Thyme blithe and blogging. I’ve included Kefir in my daily breakfast routine for years now, too. I usually just stir my daily ration of cherry juice into it. Yum. Even our Saluki dog, Jonty, has a breakfast of Kefir and oat bran. The bran gives him increased fibre in his diet and the Kefir has settled his extremely tender tummy. He is so much more comfortable now he is on the Kefir daily. I use whole goat milk for ours – and I recommend it as being a whole lot easier to digest than cow’s milk. Gorgeous. I am loving getting to grips with the kefir that you sent, it is going into my smoothies most mornings now. We are looking forward to finding more uses for it. So glad the kefir is working for you Helen, it’s brilliant stuff and hard to kill. As CT said, when we were talking about, “its ‘s tough as old boots”. I am so glad you have written this blog post. I had been given some kefir a while back and made Irish Soda Bread with it, sadly I managed to destroy the defirt 🙁 should I be given some more, I will try some of your recipes. I tried to make a cheese from it too, but it didn’t quite work out sadly. Oh bother Shaheen. It can take a while to get going, but once it does it’s fairly hard to kill. Tibi is a lot more delicate and CT’s managed to destroy quite a few lots of these grains. Thank you. You can buy bottles of it now in health food shops (or so I’m told), so maybe it’s time to try some. Thanks for this Choclette – I’ve heard of Kefir but never tried it so this was really informative. Definitely giving it a try, I’ll let you know how I get on! Thanks Kate. Would be delighted to find out how you get on. I think it’s available to buy in bottled form now in some health food shops, which might be a good way to see if you like it. Not just health food shops – but we have seen several different types in our local Polish delicatessen, too! Ooh, good idea Jenny, I hadn’t thought about that. Although our local one is probably twenty miles away. I had never heard of Kefir until you spoke of it – sounds like a big part of your life! It’s certainly become one of the routines in our life Heidi and it’s hard to imagine not having it most days. There’s no excuse….. I really need to try this. Where is the best place to source kefir grains? Hi Kate, it might be worth trying a bottle of it first to see what you think of it. I’ll see if CT know where to get kefir grains from. We’ve just given away some of ours and it will take time to grow it back, or I’d send you some of ours. Thanks Choclette. I’ve never seen it for sale either….. where might I find ‘a bottle’?? I’ve never bought it Kate, but its popularity is on the rise and I know you can get it. I’d be surprised if a good health food shop didn’t stock it. Interestingly, when we were up in Bangor last year, we came across a little kefir shop at the edge of town. The owner made it and sold it herself and her clients ranged from the local workmen to the usual suspects. She had a tiny cafe as part of the shop and we watched a surprising number of people come and go as we supped our tea. I’ll admit I’ve never tried Kefir – I’ve heard of milk kefir but not water. I’m very intrigued and must get trying some. I love how we find new (to us) food products through blogging. Yes, I’ve learnt heaps since I started blogging Helen, it’s all part of what makes it fun. As I’ve never tried hunting it down, I’m not quite sure how easily available kefir is to buy, but I know it’s on sale in some health food shops. As you probably know, I have been making my own kefir since last summer. As well as the adult members of our household, I have now started to give it to our nine-month old grandson…he loves it and doesn’t seem to have had any bad effects. I agree about the tibi being more delicate. I have lost a batch and even when it is healthy, it never seems to be as robust as the milk kefir. I always feel a bit sorry for it and have decided at the moment only to make it in the warmer months. The good thing is, I have a plentiful supply of grains to convert to water, using the excess grains, which are otherwise just jucked out! Thanks for the post, Choclette! I have never made kefir but I do purchase it at the store. I love using it in baking and smoothies. It is so healthy…I will have to try making it a home now. I used to buy kefir and drink it when I was taking antibiotics. Had not idea it was so versatile. Oh yes, very good idea Maria. Hope the kefir helped. A great post. I’ve seen it all over and had a basic understanding of it, but now I have a good grasp on it, and think I might give it a go! Thanks! Yay Debi, glad to have helped. It’s the sort of thing, once you start, you find your own way of working with it. Thanks Charlotte. Years ago, we used to make kombucha and I really liked it. When you get it right it tastes like fizzy apple juice. Sadly, the house we are living in now is just too cold to make it. Luckily, milk kefir is far more forgiving, though water kefir is a little tricksy. I’ve been intrigued by this since we chatted about it a few weeks ago and now I have this fabulous post to work with, thank you! Hope it helps Chris. I can’t promise, but if the grains have grown enough in time for the Dorset trip I could bring you some up – if you’re interested? What a great look at kefir! It’s something that has intrigued me, but I didn’t know much about. Thanks for the post! Hope it helped Kate and has got you interested enough to give it a go. Thanks for the info. I’ve only had kefir a few times and it was ages ago, not sure why? I think it would be fab in smoothies, so may have to give that a try! Interesting! I used to make kefir for a while in my teens too and I used to make it regularly then I got bored with it but that was long time ago. I use to love the taste and it is certainly very good for your gut and wellbeing. I enjoyed reading this article and why not I would like to start taking kefir again! I’m in the ‘never heard of kefir’ camp – looks interesting! Well here’s your introduction Cathy, welcome to the kefir camp. I never heard about it before….Your post is really informative. Does it taste similar to butter milk? It’s sort of tastes like a cross between yoghurt and buttermilk – creamy and slightly tangy, although you can make it to be really sour if desired. Kefir sounds delicious, I can’t believe I’ve never heard of it before! My in-laws drink this in Cyprus, but I just couldn’t get used to the salty taste. I can see it would be good added to baking and bread though. Hmmm, no salty taste to ours Jac. We don’t add salt unless we’re making cheese. It’s just milk. Such an interesting post, it’s fabulous to learn new things 🙂 I’ll certainly be asking for it in our two local health food shop as recommended by your other commenters, fingers crossed one of them will stock it! It sounds so versatile too. Good luck Angela. Would love to know if you manage to find it. Ah, but you’d be fine with the water kefir Janie and apparently you can use non dairy milks too. 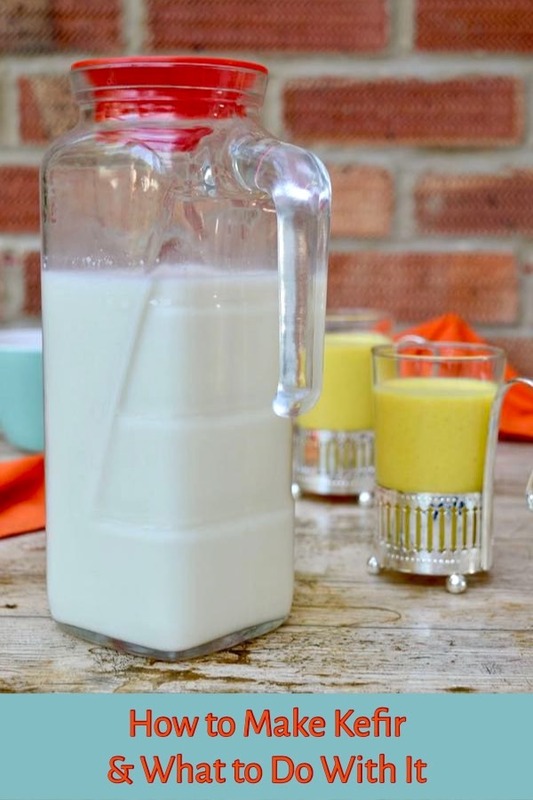 I love buttermilk and would like to try kefir grains to make some at home, I heard of it a few years back and was so kicked to know that a distant cousin – sort of- of buttermilk exists! I am going to hunt for some in stores now and will dance a jig if I find the grains! Good luck Manjiri. I hope you find some and it would be great to know what you think. You might want to try some first before you go hunting for the grains – just in case! Thanks Nadia. I’ve never actually tried anything other than our homemade one, but one of the great things about it is that you can make it as sour as you like or barely at all if sourness isn’t your thing. Hi Sharon. Apologies for the delay in replying. I’ve been away for the past week. Hope you managed to find out what to do. I’ve never tried goat’s milk kefir, so that’s interesting. When starting kefir it can take a few tries before you get something palatable, so it’s best to throw away the first couple of batches – unless it tastes OK of course. Then it’s just a case of pouring the kefir through a sieve and drinking it. Put the grains back (unwashed) and top up with milk again. I am very late to this post. I admit that while I had heard of kefir I didn’t really understand what it was / the benefits. So thanks for the info! Hope you give it a go Claire, it’s great stuff. Do let me know how you get on with it. I was recently in Panama friend offer me a glass of Kefir he had made, this was just something I drink when I was just a kid, I want t learn how to make it and start drinking every day that is taste stuff. Thanks Nilsa. We drink kefir most days. It’s hard to imagine living without it now. I’ve been making water kefir for months now but am keen to try the coconut version…can I use my grains for the coconut milk? Probably not a good idea. I’d advise using milk kefir grains instead. You’ll probably need to refresh them with dairy milk from time to time to keep them vigorous. I’ve heard so much about kefir but still haven’t tried it yet. It’s definitely something I’d like to start adding to my diet though. It’s suddenly become really popular, which is great to see. It’s even on sale in our local supermarket now. Hello, I’m Choclette. I’m a vegetarian whole food recipe developer. I have a sweet tooth and a passion for baking and chocolate. Welcome to my award winning blog. Here you will find nourishing home cooked food with a twist as well as wholesome foodie tales.